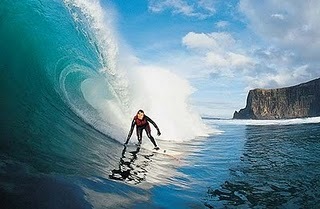 Where to find killer surfing waves in Ireland? News this week of a new 'killer' wave off the west coast of Ireland, had surfers here bristling with excitement. All the more so, as the exact location was being kept secret?. We have our suspicions though, Mullaghmore or Easkey perhaps? Obviously not for the faint hearted or amateur, waves like this 'monster prowler' first captured our imagination and respect in a TV advert for a bank that was released a couple of years ago. The incredible footage, you can watch it at the link below, featured Irish surfing champions Fergus Smith and John McCarthy, tackling the 80' high Ailies wave beneath the Cliffs of Moher, which are scary enough in their own right.